Bachmann's USRA 0-6-0 and Prairie 2-6-2 steam locos are essentially the same model (the only difference being the tenders and the 2-6-2's pilot and trailing trucks), so I'm going to cover them both here. Like the rest of Bachmann's line of cheap "trainset style" locomotives, these have had a long history of assorted revisions and refinements (with fairly radical changes from one version to the next). And although the locomotive and tender shells have remained essentially the same throughout, there are a couple of slightly different versions of those as well (but more on all that in a moment). These are generally found in the old blue (or yellow) plastic boxes with the clear plastic hinged lids (although to further muddy the waters, I've also found them in the Bachmann "white cardboard box"). This was the only 0-6-0 release that came with a correct USRA-style tender (all subsequent 0-6-0 releases having slopeback tenders). All pickup is from the drivers (the tender being electrically neutral). There are no traction tires. And like all subsequent versions, there is no lighting. 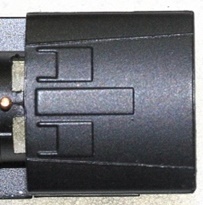 The drive gears are situated directly next to the drivers. The motor is a pretty cheap looking 3-pole affair, although it does have the virtue of not sticking out like a sore thumb (the end-plate hanging out of the cab being black, as opposed to the shiny silver backplates found in later versions). The running gear hangers on this model are metal (all subsequent versions having plastic hangers). Both the pilot and tender couplers are Rapidos, with the tender coupler being mounted to the tender shell. These models run OK - being relatively smooth and quiet. Unfortunately, due to their limited pickup, they're pretty much dead in the water as far as getting through turnouts is concerned. Also, I've noticed that it's kind of hard to keep the drivers properly quartered (the end result being a lot of shimmying and shaking). Due to the lack of traction tires, these engines can't pull much without slipping. These models (like the first version) derive all their pickup from the drivers. The chassis is completely redesigned (probably to allow for the addition of the extra trucks on the 2-6-2). 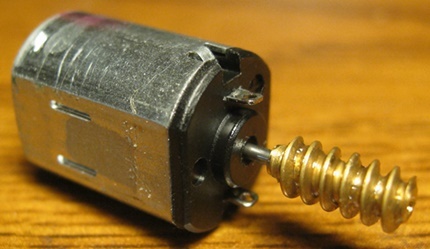 The motor is different than the one in the first edition, and presumably of higher quality. The axle gears on this version have been relocated beneath the bottom plate (IE no longer located right next to the drivers). All three sets of drivers are geared. Performance is about the same as the first version - relatively smooth and quiet, but not much of a puller (again, due to the lack of traction tires). Given the limited pickup, turnouts are still a problem. Sometime in the mid-1980s, yet another new version of the 0-6-0/2-6-2 model was conjured up in Hong Kong (this one found exclusively in the familiar Bachmann "white cardboard box"). Major new features include tender pickup (although only from the forward truck) and traction tires on the forward drivers. The motor was upgraded technologically (still three poles, but now skew-wound), while simultaneously being downgraded aesthetically (what with the new "giant piece of ugly metal" sticking out the back of the cab). The mechanism itself is the same as in the previous version. Despite the changes, improvements in performance over previous versions are minimal. Subtracting pickup from the drivers (in the form of traction tires) in favor of adding tender pickup seems to have been a zero-sum gain, as this version seems to be just as finicky through turnouts as previous releases. Pulling power is increased, but not by much. I suspect that the additional drag introduced by the relatively primitive axle-wiper pickup on the tender is responsible for nearly cancelling out the benefits of the traction tires. And unfortunately, said traction tires introduce a whole lot of new wobbling into the equation. Admittedly, it could just be the affects of old age I'm seeing in these models. But whatever the case, I've yet to encounter one that ran particularly well. Circa 2004, these models were revised yet again. Changes include a new split-frame mechanism, traction tires relocated to the middle set of drivers, blackened running gear and handrails, and nicer paint. Also, the forward drivers are no longer geared (being turned solely by the running gear). Performance on this version is actually quite excellent - smooth, relatively quiet, and damned near perfect. Relocating the traction tires went a long way towards solving the pickup problems evident on previous versions. Unfortunately, pulling power seems to have suffered, as this one is unable to pull the same number of freight cars as my 1985 2-6-2. I'm not sure what happened there, as the two seem to weigh about the same. Still, performance is quite respectable and I'd be tempted to give this version an "A" rating if they weren't so damned ugly... But hey, paint the motor black and the end result is a very serviceable (if unspectacular) steamer. One problem I've run into with this split-frame version is that, out of the box, the mechanisms can be a bit bindy (with the end result being stalls at slow speeds and overall uneven running). Like a lot of Bachmann's steamers, the problem seems to be with the way the models are assembled at the factory, and the solution is to adjust some (or all) of the screws that hold things together. I had a very bindy 0-6-0 and was able to solve its problems by simply tightening the two screws that hold the sides of the chassis together. These split-frame models come in plastic jewell cases. Couplers vary depending on when a given model was made (early production runs came with Rapido-style couplers, more recent production runs came with Bachmann's one-piece knuckle couplers, and the most recent production comes with Bachmann E-Z Mate automatic/magnetic couplers). Ala-carte Rapido-style couplers are included in the box on the newer releases (should you want to go that route). In addition to the motor change, the little notches in the shell (just forward of the cab) that originally served to accommodate the old square motors have been removed. One oddity with this redesign is that Bachmann retained the wheelwipers on the rear driverset. 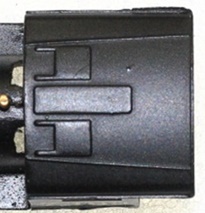 In the previous version, these wipers also served to transfer chassis current to the motor contacts. But since current flows directly from the axle sleeves into the chassis (and then on to the motor) in this version, the wipers would seem (to me anyway) to be completely redundant. So, a bit of a headscratcher there. Performance on this latest version is at least as good as the original 2004 split-frame release (if not better). Super smooth, whisper quiet, decent slow-speed creep, no pickup or derailing problems, etc. My only minor complaint is that the forward tender truck still uses axle-wiper pickup, so pulling power is somewhat diminished due to the extra drag imposed by said wipers. As delievered, my new 2-6-2 can only handle about 13-14 assorted freight cars on level track before its wheels start slipping. So, no, not bad. But then again, not particularly impressive either. Overall though, these are smooth and reliable runners. And now that the motors are no longer visible, they're very nice looking models as well. 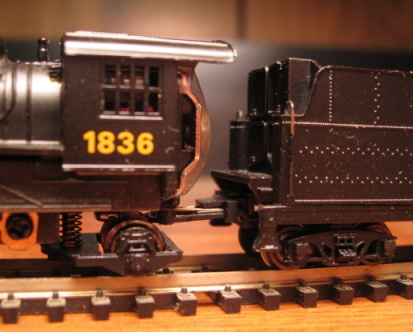 If you have one of these split-frame 0-6-0's or 2-6-2's and want to increase its performance dramatically, I recommend replacing the stock tender (with its primitive one-truck / axle-wiper pickup) with one of Bachmann's newer Spectrum tenders. These tenders are much more free-rolling than the stock tenders and all eight wheels provide pickup - thus simultaneously increasing pulling power and providing flawless current collection. To remove the locomotive shell, simply unscrew the screw in the center dome. The shell should then lift right off. Although their Spectrum boxes make no mention of DCC (or DCC readiness), the Bachmann website (along with others) have described these tenders as being "DCC Ready". 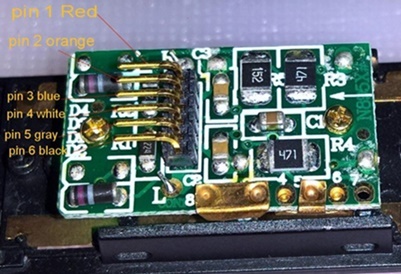 Unfortunately, the boxes contain zero documentation, so this somewhat misleading description continues to create a fair amount of confusion amongst the newbies (who think they can magically convert a non-DCC steamer to DCC by simply hooking up one of these tenders and then plugging in a decoder). Well, no, not exactly. Excluding the slopeback tender, what these models have are PC boards with metal contact pads (to which one would solder decoder wires) and then a six-pin connector for a wiring harness that would run forward to the locomotive (for track power, motor control and lighting control). The slopeback tenders do have all-wheel pickup (and are an improvement over the slopeback tenders sold with the 0-6-0), but they are too small to house the DCC-Friendly PC boards found in the rest of the line. 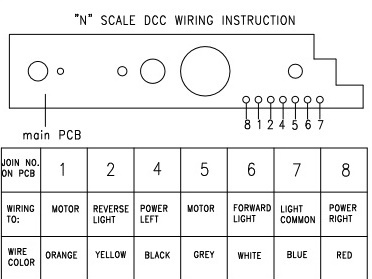 The decoder wire contacts are numbered 1-8 (as per standard NMRA practice). 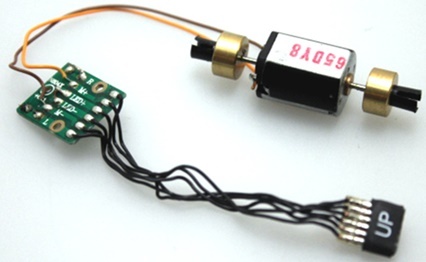 So, when installing a decoder, you would first remove the metal "analog mode" jumpers from the contacts and then solder the decoder wires to their corresponding contact pads (orange wire to contact #1, yellow wire to contact #2, etc). On a side note, I think the little solder blobs labeled "R3" and "R4" might be outputs for a reverse light, but don't hold me to that. 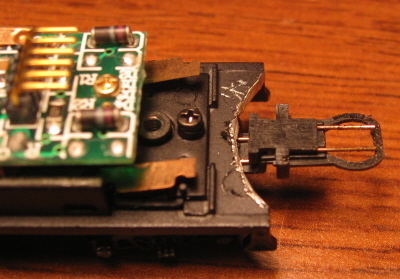 To wire the tender to the locomotive, you would first connect wires for motor control and headlight control to the corresponding pins on the six-pin connector (their color coding per NMRA DCC standards are shown in the picture above). Then you would solder the other ends of the wires to the motor and the headlight (first making sure that they are isolated from track power inside the locomotive chassis). Wiring up the pins for track power may or may not be necessary. If the locomotive in question employs a split-frame design (like the new 0-6-0 and 2-6-2 models) whereby current runs through the chassis itself (and then out bi-polar drawbar pegs), they would not be needed (locomotive current would reach the tender PC board through the drawbar wires, rendering the track power wires on the six-pin connector moot). 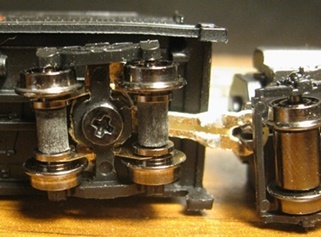 If track power does not flow out of the locomotive's drawbar pegs, then you would indeed have to wire up the two pins for track power (and then connect the other ends to a source of track power inside the locomotive - basically to whatever it was that was originally getting current to the motor). FYI, I'm told that these tenders were not big sellers for Bachmann and have likely been discontinued. So, if your idea is to acquire one or more of them, best to do it sooner rather than later. The Vandy tenders in particular remain in high demand and have become quite difficult to find.